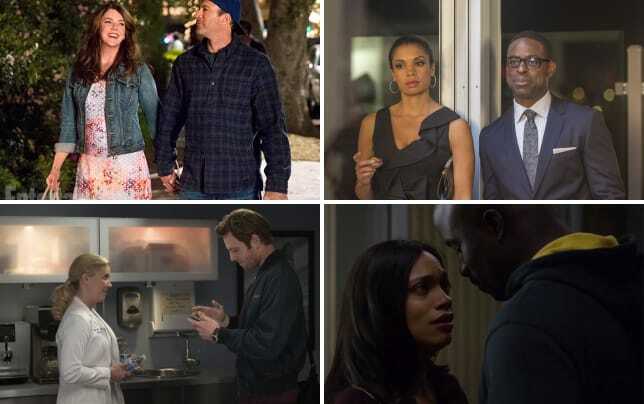 The writers continue to explore real emotions and the complexities of relationships. 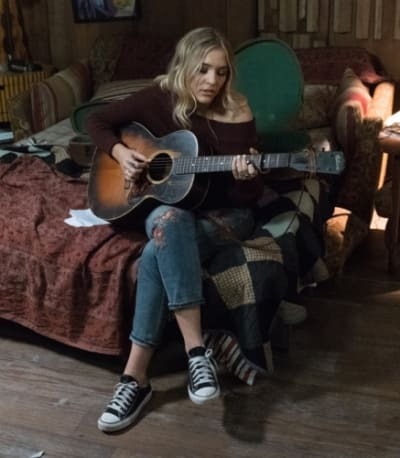 On Nashville Season 5 Episode 5, Maddie learns more about Clay in hopes of pursuing a relationship and Scarlett and Gunnar are reminded of their past mistakes while filming a music video. When Damien first described the character Scarlett would be portraying, my first thought was: she CANNOT play that character. Scarlett is a lot of things: kind, talented, romantic, sensitive. Scarlett is not wild, manipulative, flirtatious, or uninhibited. I know that the best music comes from an honest, deep, raw place but Damien took it a little too far in my opinion. It's about taking all of your pain, what you desire, and laying it bare. So if you're just standing there because that guy said don't just write poetry, sing and you were like aw shucks, if you say so then you should just quit now. Go back to writing your big feelings in a little notebook and letting people treat you like a doormat. Scarlett has a history of mental breaks. Worse, instead of telling people she's breaking, she usually tries to stick it out which only makes her break harder and more devastatingly. You could really see her character spiraling in this episode. With each interaction with Damien, she fell further into her emotions. I know Gunnar can be daft sometimes, but he knows Scarlett better than most; he should have been able to see she was going into dangerous territory. By the time he spoke up, it was too late. The point of no return happened when Damien mentioned her taking Gunnar back after the mistakes he's made in the past. Tell me are you or are you not the woman who apologizes when she hasn’t done anything wrong; who smiles when what she’s really feeling is angry; who takes back her man, folds his socks, after he’s slept with half of Nashville. Go ahead, walk away. Just know what life you’re choosing when you do it. I thought Rayna was a little quick to throw out the word "abuse" but by the end of the episode, Scarlett did seem emotionally beat up. I hope the experience shows her parts of herself she typically shies away from, and eventually helps her without permanently scarring her. I also hope it doesn't tear her and Gunnar apart. It's true that she has been very forgiving with him, but that doesn't mean she's weak. Its clear they really love each other, they've just screwed up a lot on their roads back to each other. We're all just human after all, trying to make the best decisions we can, in hopes of becoming the best versions of ourselves. Scarlett: Gunnar, I’ve made my peace with the past but it doesn’t mean I want other people knowing about it. I’m ashamed of what they might think of me; what a weak person I must be to keep taking you back. Gunnar: Ok, I’m sorry. But for what it’s worth, I think you’re dead wrong. I think you’re so damn strong. I’m thankful for that. Every day. While Scarlett and Gunnar showed us how love emotionally hurts, Maddie and Clay illustrated how love physically hurts. Clay and Maddie seem to have a lot in common, the most important of which is their love of music. That is what instantly bonded them and ultimately, if they stay together, it will be the foundation of their relationship. Clay seems like a nice person with good intentions but he has some issues that may be too complicated for Maddie. He had a troubled childhood due to his mother's addiction, he struggles with bi-polar disorder, and he feels like he lives with a target on his back because, despite the fact that its 2017, racism is still alive and kicking. Literally, in his case. Maddie: It's just every time I feel like we're taking a step forward, he like clams up or something, and he just keeps saying I don't know what I'm getting myself into. Then last night he was mean for no reason. Juliette: Then you should take him at face value and move on. Maddie, if a guys not treating you right that doesn't mean there's some sweeter, nicer version of him in there and it's your job to try to find him. Maddie was naive to think there wouldn't be additional complications if they chose to be together. I love that she went to Juliette for advice. They've always had that kind of relationship where Maddie can be honest with her and Juliette's already been there and done worse so she is honest right back. Juliette also doesn't sugar coat things. She treats Maddie like a woman rather than the teenager she is. While I personally think Maddie is too young, mentally and emotionally, to be with someone like Clay, I'm interested to see if he can help her grow into a more mature, less ignorant person. Now for Rayna. Poor Rayna. When she's not worrying about Maddie and her new boyfriend, she is worrying about her stalker. She suspects Randall, which is weird because, although he comes off as creepy to the audience, her character has never made any indication that she thought he was creepy. She mostly treated him like a love sick, over eager puppy. Nonetheless, this week she suspects him and even knows exactly where he hid the box with Maddie's picture on it. Of course it wasn't him. As I mentioned in my review last week, I was beginning to think it wasn't him or Zack. I may have been right because when she gets back to Highway 65 there's a suspicious man demanding to see her and yelling about letters he's sent. 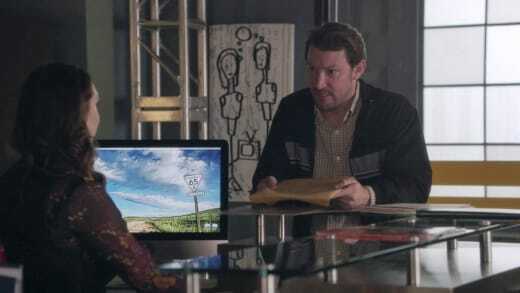 Is he the stalker or did the real stalker hire him to throw Rayna off? If she thinks he's been caught, she'll let her guard down and then she'll be easier to get to. What do you guys think? Is he the stalker? Was Zack trying to poach Will from Luke? Will we finally see Luke? How will the music video affect Scarlett and Gunnar's relationship? 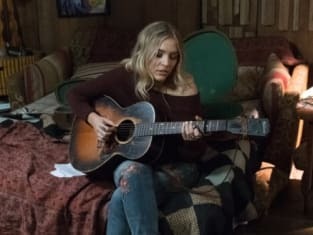 If you missed this episode or any others you should definitely find time to watch Nashville online via TV Fanatic. Tiffany Staton is a staff writer for TV Fanatic. Follow her on Twitter. The fact that you don't see what I'm talking about is part of the problem. Permalink: The fact that you don't see what I'm talking about is part of the problem. Oh my god, I get it. I'm sheltered and uncultured now stop saying that. Permalink: Oh my god, I get it. I'm sheltered and uncultured now stop saying that. 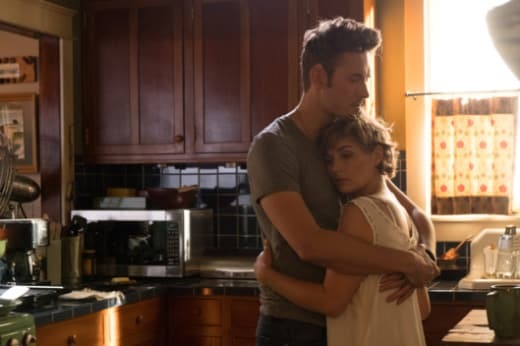 Nashville Review: Is Love Worth All This Pain?